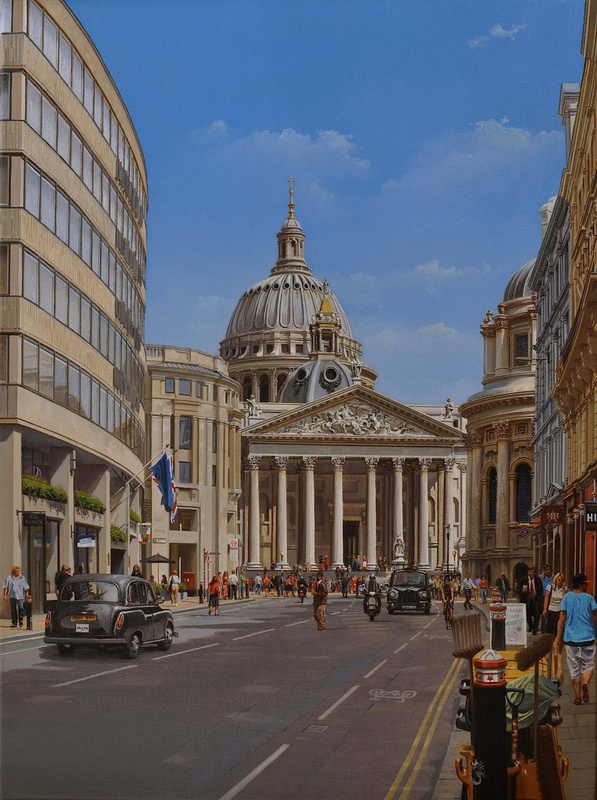 I seem to keep crossing paths with St. Paul’s Cathedral in my work, beginning with a painting for John Simpson of his Paternoster Square project in 1988, the dome and western tower of St. Paul’s hovering over the proposed development. I was recommended for this by Leon Krier for whom I had just completed paintings of his project for Atlantis in Tenerife. 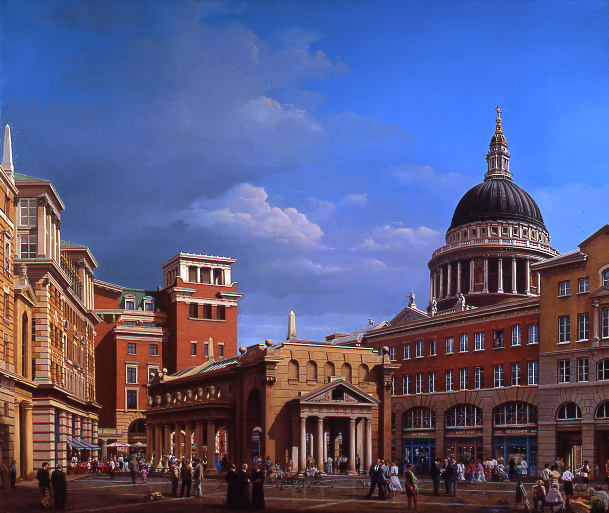 He had drawn up an alternative, lower density brief to that of the official competition for Paternoster Square and enlisted John Simpson to develop a scheme based on that brief. 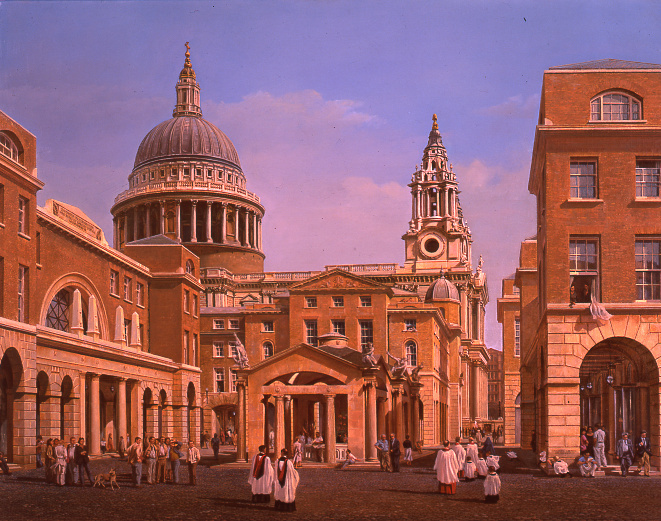 Then in 1995 after my Palladio painting, Almerico to Zeno, was seen in the RA Summer Exhibition, I was commissioned to paint a capriccio depicting the work of Sir Christopher Wren which resulted in Si Monumentum Requiris. 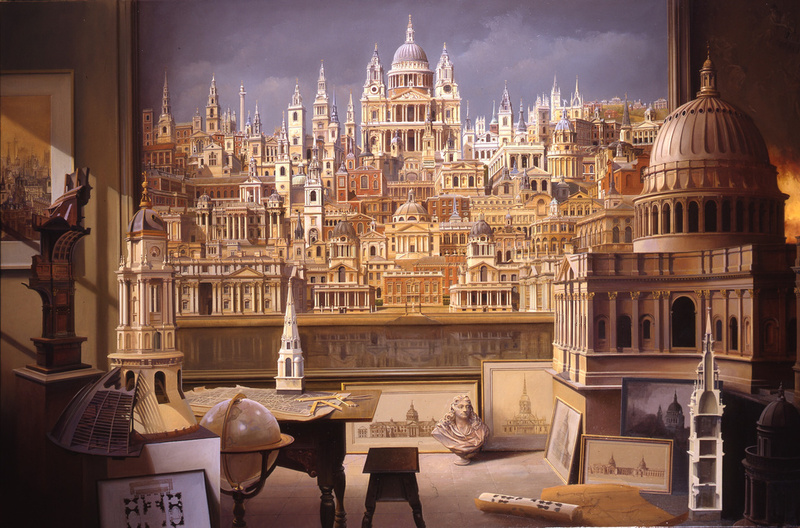 St Paul’s is inevitably positioned at the apex of the composition and various models of the building are depicted, including Wren’s Great Model, along with drawings of the many preliminary designs, the famous photo of St Paul’s in the Blitz and a hint of the fire that led to Wren’s commission. 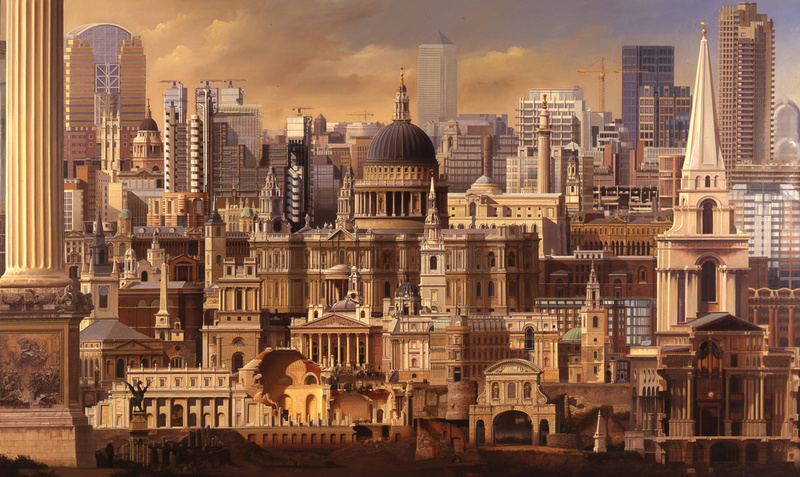 Then in 1997, St Paul’s emerged in the centre of another commission, The Square Mile, which represented a number of The City’s buildings from its Roman beginnings in the form of the Temple of Mithras in the foreground through the various periods of development to recent high rise buildings in the background including what was at the time London’s tallest building, Canary Wharf, not actually in the City but signifying Dockland’s emergence as a rival financial and business centre. 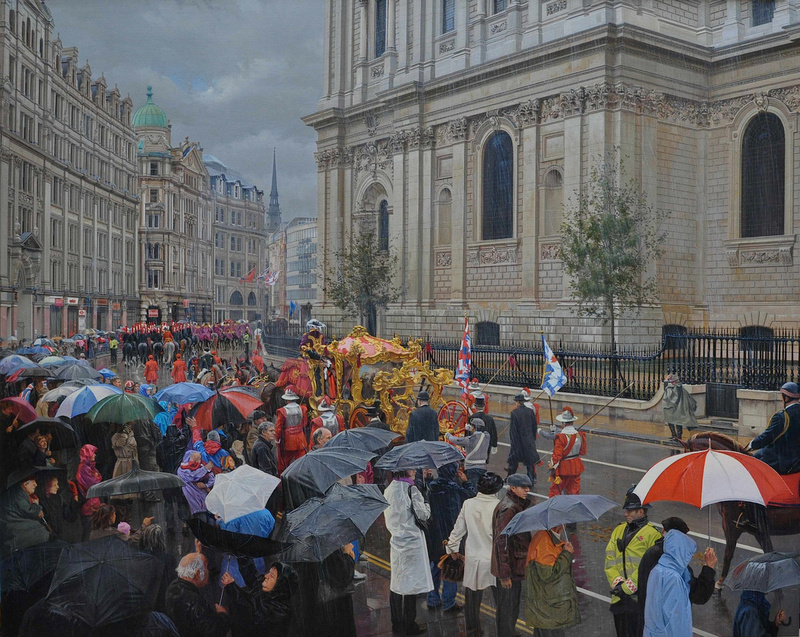 St. Paul’s did not reappear as a subject for me until the 2010 group exhibition, Images of St. Paul’s in the 21st Century celebrating the 300th anniversary of the opening of Wren’s new Cathedral. 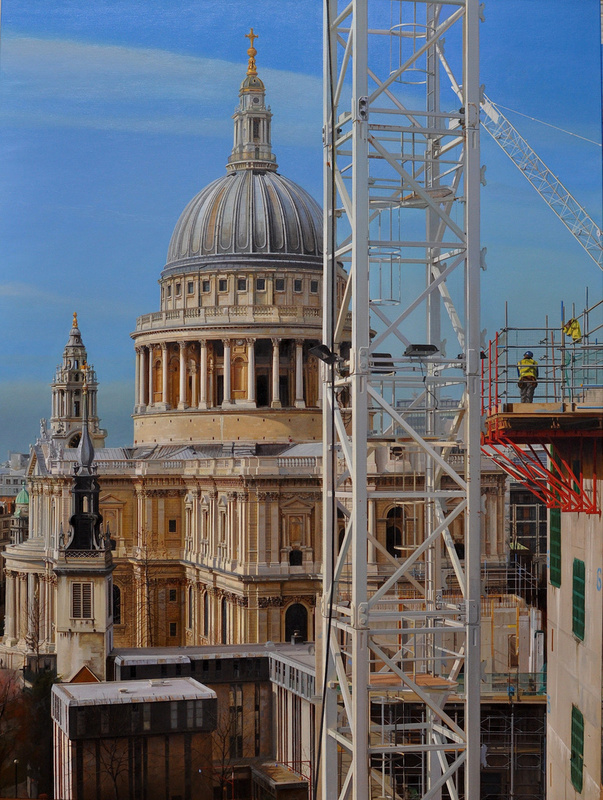 For this I revisited the Great Model, painting it and Hawksmoor’s unbuilt Baptistry as though built and seen from Ludgate Hill in A Different Perspective, Proposals for a New Cathedral and Baptistry by Sir Christopher Wren and Nicholas Hawksmoor Respectively. This was interesting as the survival of the 18th century street pattern allowed the introduction of the two buildings into the present day fabric of buildings in the relationship to each other Hawksmoor intended, approaching the Cathedral off axis into a space where the Cathedral and Baptistry face each other, much like the Duomo and Baptistry in Florence. 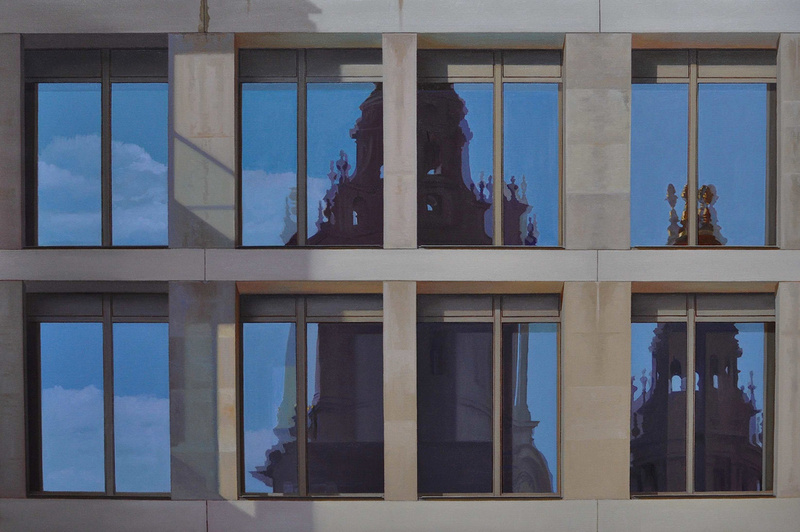 I also produced paintings from and of the emerging One New Change by Jean Nouvel, The Lord Mayor’s Parade passing St. Paul’s, and the reflections of the western towers of the Cathedral in the windows of Eric Parry’s new Stock Exchange building in Paternoster Square. 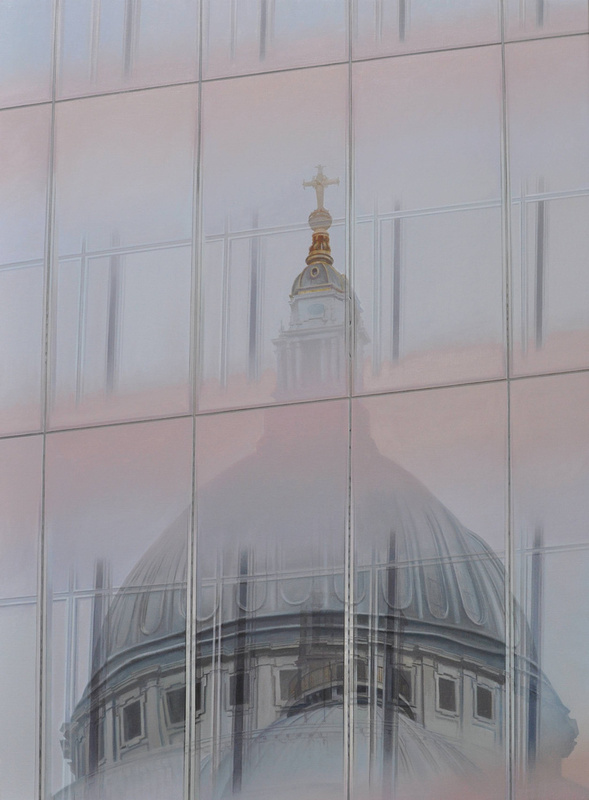 The latter bringing me back nicely to my starting point with St. Paul’s at Paternoster Square.